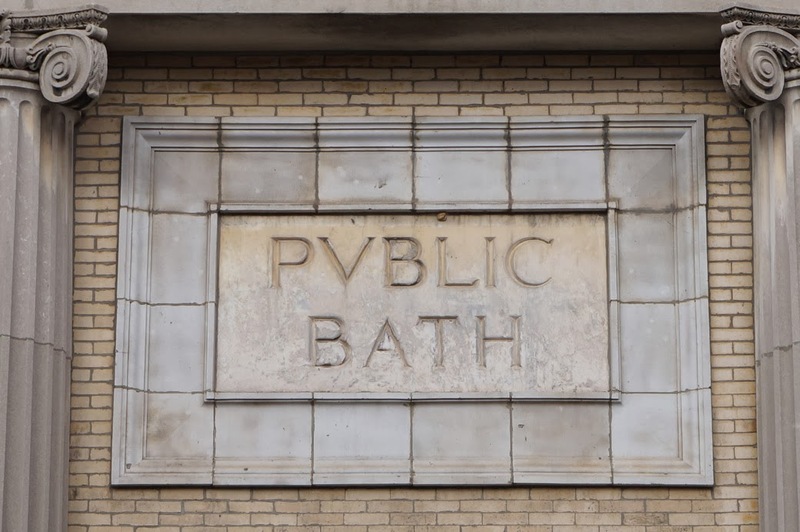 The Public Bath on Huron Street is one of the few remaining structures from an important but almost forgotten movement for progressive urban reform. Prior to tenement laws which required bathroom facilities in every flat, many of the urban poor had few bathing options. The objective of the Public Bath Movement was to improve public health, as well as the dignity and upward mobility for those living in tenements. 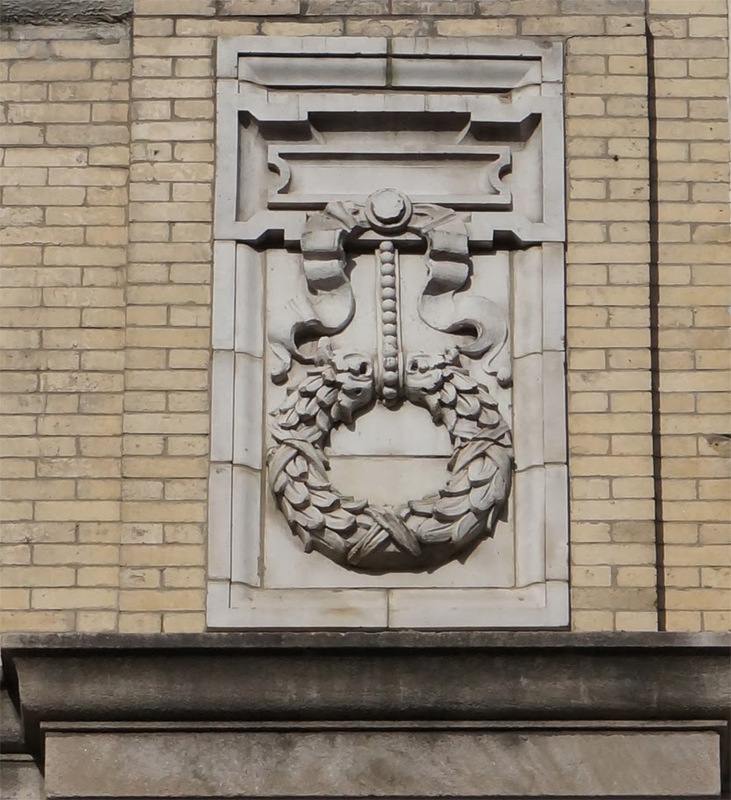 Most of the public baths in New York City were planned and designed based on recommendations from Dr. Simon Baruch and the Association for the Improvement of the Conditions of the Poor (A.I.C.P.). Dr. Baruch, dubbed "father of the public bath", was a professor of hydrotherapy at Columbia University, an outspoken advocate for public baths and the father of financier Bernard Baruch. Included in the A.I.C.P. recommendations were two standard lot sizes, a preference for "shower baths" over bath tubs and greater capacity for male bathers. The A.I.C.P. architects Cady, Berg & See provided two model plans, the "Type A" for small city lots and "Type B" for larger lots. 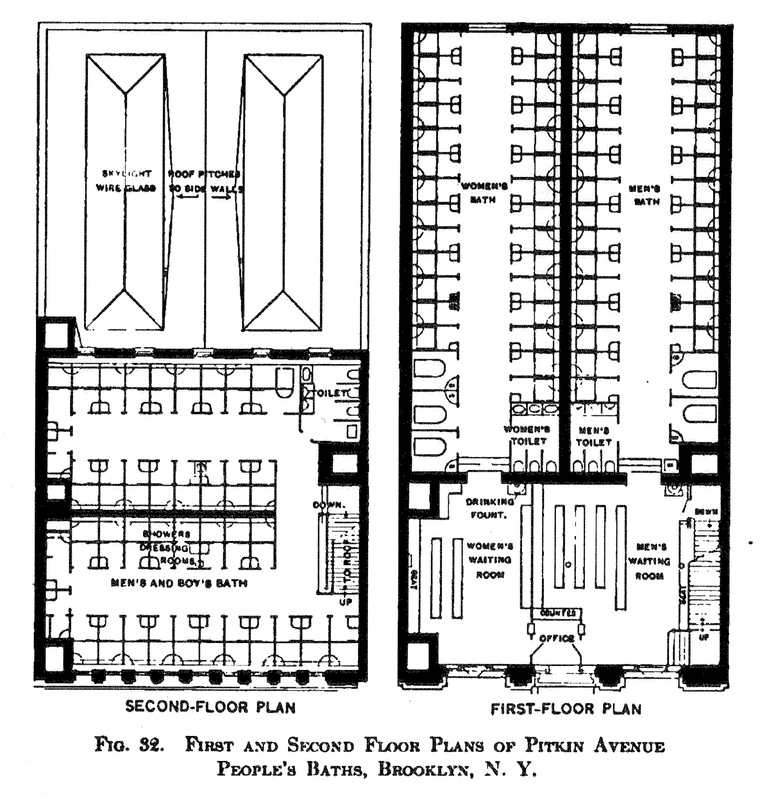 The Public Bath on Huron Street was built on the "type B" 50' x 100' lot and its layout is almost identical to that illustrated in the plan of the Pitkin Avenue Public Bath shown above. 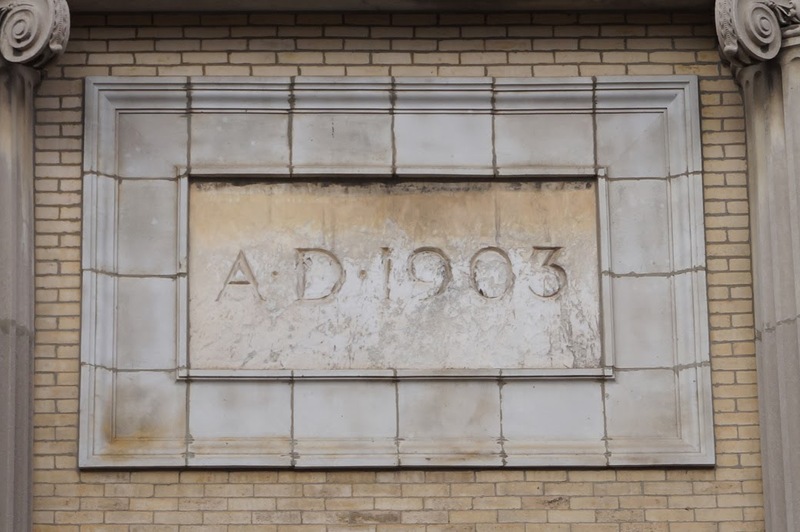 The Huron Street Public Bath was built in 1903 at a total cost of $103,724 and opened in 1904. 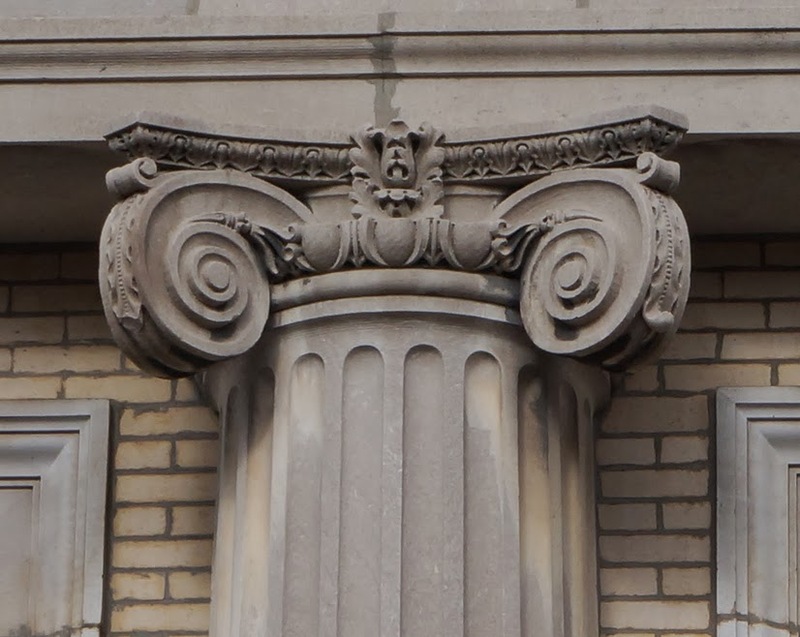 Similar to the other public baths in NY built at the turn of the last century, the Public Bath on Huron Street is a Classical Revival style building designed to be “imposing in appearance with an architectural style recalling ancient Roman public baths with classical pilasters, columns, arches and cornices”. The Public Bath was renovated by the WPA in the late 30s along with the other Brooklyn public baths; work included “repairs and replacement of mechanical equipment, new roofing and skylights, new tile walls and floors, new marble enclosures for the showers, replacing the old soapstone stalls, as well as details of outside renovation such as sand blasting and the resetting of entrance steps” The Huron Street bathing facility was steam heated, an amenity that was lacking in the coal fire furnace heated public bath across the creek in Long Island City. When reviewed by a reporter in 1956 the building contained 25 shower stalls for women, 62 for the men and 2 tubs, one on either side of the bathhouse. The layout of the bath included a separate entrance for men and woman with a booth in the middle, which at the Huron Street location offered soap and towel rentals. At its peak the Huron Street public bath served over a thousand people a day on average but by the time it closed that number had dropped to 25. In 1955 the state law requiring each county to maintain a public bath was amended. 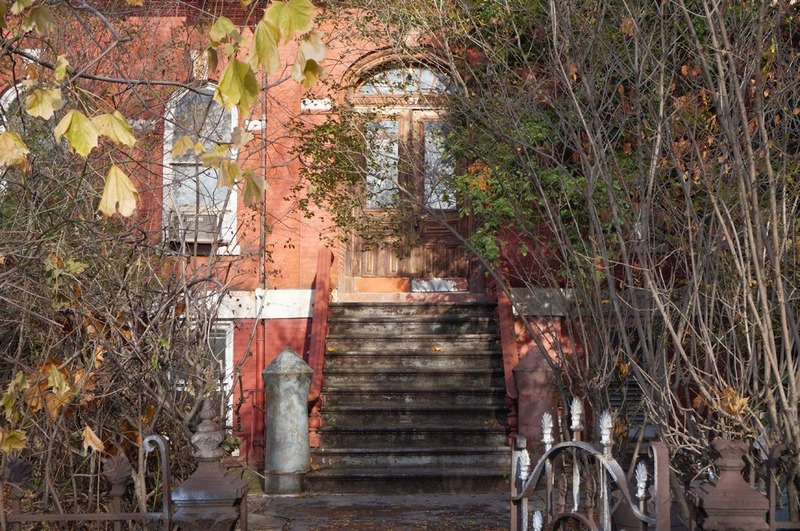 After the amendment passed, the Greenpoint bathhouse was no longer mandatory, leaving it vulnerable to city cutbacks. 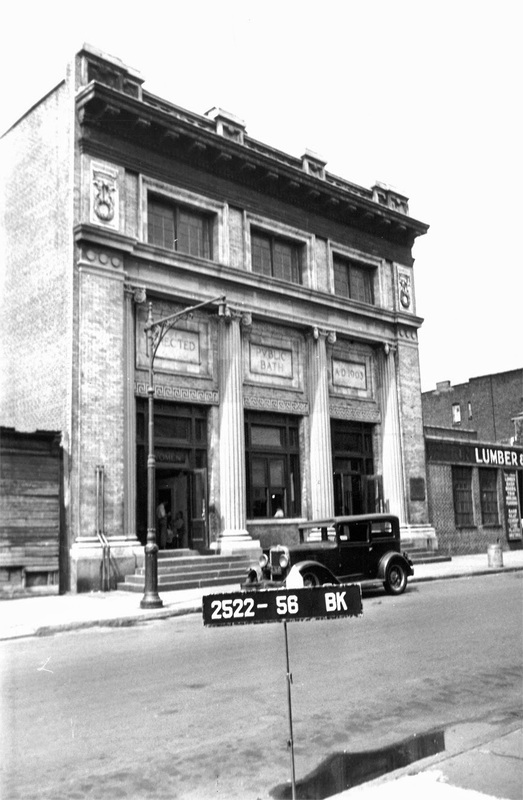 Most of Brooklyn’s public baths closed between 1949 and 1953 and by 1956 the Public Bath on Huron Street was the last remaining public bath operating in Brooklyn. The Huron Street facility was decommissioned and closed its doors on December 12th 1960. After closing, the building was eventually auctioned off by the city and is now owned by the proprietor of a custom gilding and framing company (Cowood Gilders) that is operated on the first floor of the building; the building’s second floor is rented out as artist studios. New York city had a total of 25 public baths, seven of which were located in Brooklyn. With the exception of Public Bath No. 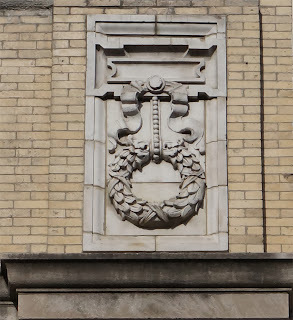 7, the public baths of Brooklyn were designed by either architect Axel S. Hedman or Louis A. Voss. Below is a list that includes all of the Brooklyn public baths, as well as their fate from what I have been able to surmise by using information from various articles and by using Google Streetview. 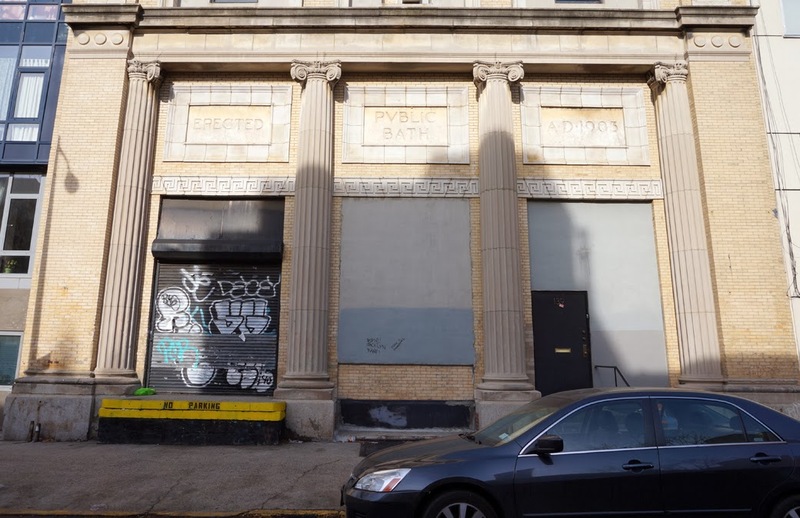 Like the PLAV building located on Lenard Street, the cornice of the bathhouse has been removed due to maintenance costs and liability concerns and replaced with concrete. 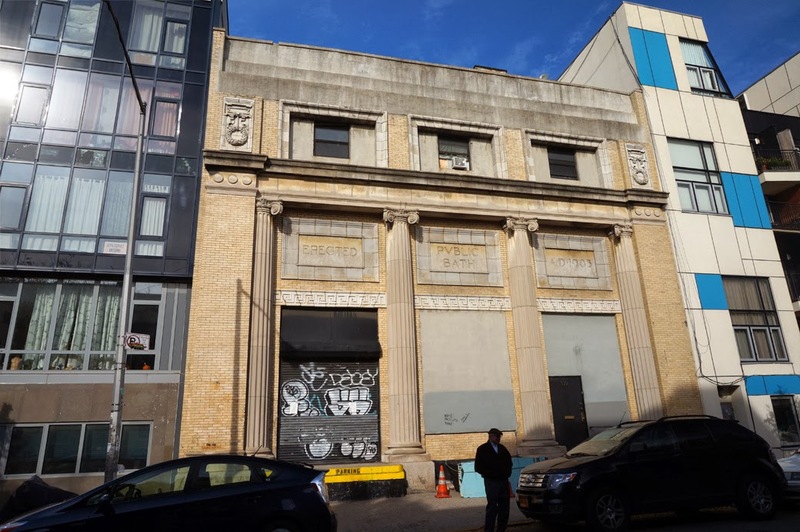 Because of these concerns, as well as local law 11 requiring the repair or removal of any projecting masonry deemed unsafe on all buildings greater than six stories, many cornices on old New York buildings have been removed. The sexes were segregated within public baths. The filled in fenestration on either side of the first floor represents the separate entrances for men and women. Terracotta Detail "A D 1903"
Corby, Jane “S.R.O. Days of Yore Appear Gone Forever” Brooklyn Daily Eagle. New York City Landmarks Preservation Commission. Public Bath No. 7 Designation Report. New York 11, September 1984. The mansion on the corner lot where Gurnsey Street turns into Oak Street was the Greenpoint home for the aged. The Greenpoint Home for the aged was incorporated in 1882 and housed on Dupont Street until completion of the red brick mansion at 137 Oak Street. Built in 1887, the residential building is an eclectic Italianate mansion with Romanesque arches designed by prominent Eastern District architect Theobold Engelhardt. While it used to be a home for the aged it has been repurposed for other residential uses throughout its life. For a time the home was used for elderly women; however according to a long time resident of the area the building has been a boarding house for men for at least 20 years. 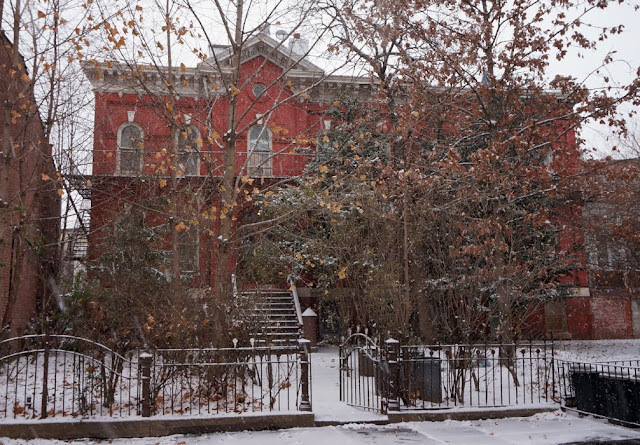 Property records show that the current owner or owners bought the home in 1967 which is likely when the building was converted into a boarding house. The wooden double doors and cast iron balustrade railings at the building's entrance, as well as the iron fence and gate at the properties' edge are original. The three-bayed wing on the right of the building was an extension likely built shortly after construction was finished on the main portion of the residential facility. 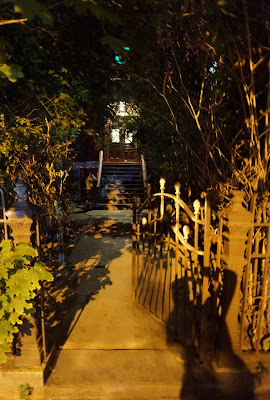 I live less than a block from this house and it was one of the buildings that got me thinking about writing this blog. The house is at once beautiful and creepy which makes it fascinating to look at. 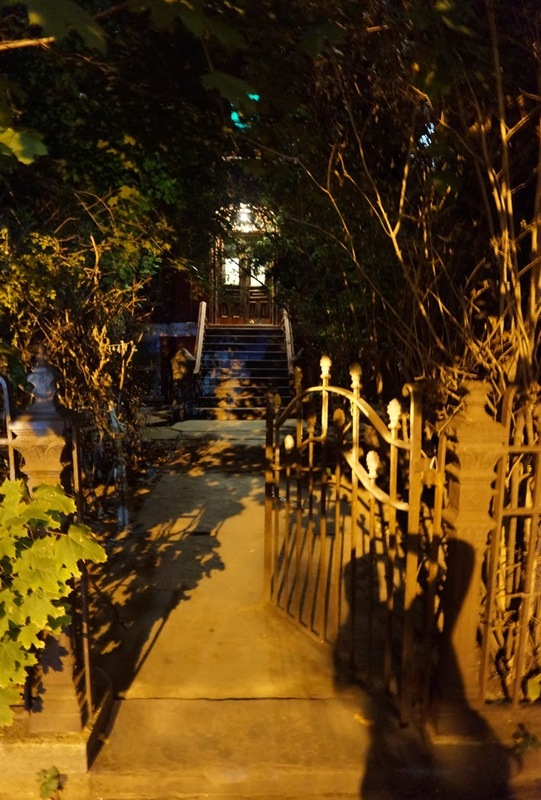 According to my neighbor who grew up in Greenpoint, all of the neighborhood kids were frightened of the place and considered it haunted. Although, I have my doubts about the mansion being haunted, some of the residents are a bit creepy which adds to the building's mystique. Aside from the men that live there, some of the other oddities I have noticed include: (1) I have never seen anyone enter or leave through the front door, (2) I once went months without seeing any sign of life in or around the house, and (3) the only woman I have ever seen enter the place (at night) slammed the perpetually open gate while shooting me a disdainful look before disappearing into what looked like the basement entrance.